There are a total of sixteen (16) winding heads, with each head independently powered and controlled to rotate clockwise, counter-clockwise or auto-reversing according to the particular watches being wound. The winding time is adjustable to provide the proper number of turns per day (TPD) recommended by the watch manufacturer. Precision ball bearings are used for all rotating elements to assure long and trouble-free life. Input electrical power is universal, 100 to 240 volts AC and 50 or 60 hertz. A supplied electronic "switcher" power supply converts incoming AC power to low voltage DC which powers the ironless core, low current motors. The Italian handcrafted cabinet demonstrates the complicated art of "intarsia," the process of using exotic woods and metals as inlays for decorating fine furniture. The cabinet is totally finished in Madrona Burl veneer with accent stripes and quadrant inlays made of Black Pearwood and circular inlays around the quadrants made of Satin Brass. Madrona, or the Strawberry tree as it is sometimes called in Europe, is a rare and beautiful Mediterranean species. The decorative burl pattern is caused by growths on the sides of Madrona trees where hundreds of branches have started to grow. Madrona Burls are quite rare and prized for their beauty and complexity. Also available in Mahogany or Rosewood veneers, the cabinet is finished with a high gloss, multi-coat polyester lacquer that is extremely durable and maintenance-free. 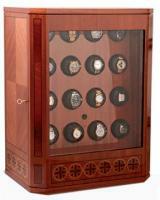 The slide-out drawer provides storage for pocket watches, watch certificates and/or related documents. The hinged plate glass door is supplied with a security lock to prevent unauthorized access as is the rear solid panel door.